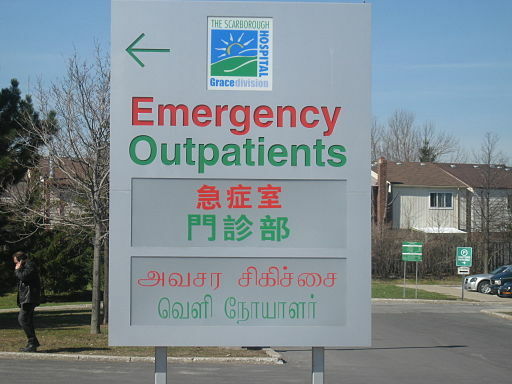 Sign at the Scarborough Hospital’s Grace Division in English, Chinese (Mandarin), and Tamil.By Taprobanus [Public Domain], via Wikimedia Commons. Like Clifford, Stuart Hall encourages scholars not to defer to categorical thinking. In his influential essay “Diaspora and Cultural Identity,” Hall suggests diaspora is best defined “not by essence or purity, but by the recognition of a necessary heterogeneity and diversity; . . . by hybridity. Diaspora identities are those which are constantly producing and reproducing themselves anew, through transformation and difference” (80). For Hall, “diaspora” names cultural identities and social movements that resist categorization and trouble (typically national) categories that contain and constrain identity. As a critical concept, diaspora’s scholarly value lies in its ability to expose weaknesses within categorical thinking about racial, ethnic, cultural and national identities. As even this brief summary shows, “diaspora” is a capacious concept. Many debates remain ongoing over which communities are—and are not—diasporic. For example, some only apply the term “diaspora” to communities that are forcefully and traumatically exiled from their homelands; others maintain that communities whose mobility is a matter of choice or an expression of economic freedom are also diasporas. As a label, the term “diaspora” has been applied to inter- as well as intra-national migrations, such as with the Newfoundland diaspora in Canada. Temporality is also a source of debate within this field: is a “diaspora” only those individuals who left their homeland, or can any generation after migration be considered diasporic? How many generations? At what point do diasporic communities become part of national communities? The point of asking these questions is not to arrive at a single answer; instead, as you read through different scholarly and literary texts, remember to compare how others approach these debates. Try to understand their logic with regards to categorical thinking. Just as there is no universal subject of the nation, there is no wholly representative diasporic figure. This specificity makes it vital that you rely on focused close readings and offer textually specific claims while studying diasporic literature. Answer Gunew’s questions for any texts by diasporic authors you are reading (for example, consider works by Dionne Brand, Fred Wah, Madeleine Thien, Wayson Choy, Rohinton Mistry, Shyam Selvadurai, Rita Wong, Vivek Shraya). If you happen to be studying works by two or three diasporic authors, ask: where are these authors’ reflections on identity similar, and where do they diverge? What accounts for their similarities and differences? Clifford, James. “Diasporas.” Further Inflections: Towards Ethnographies of the Future. Spec. issue of Cultural Anthropology 9.3 (1994): 302-38. Print. Gunew, Sneja. “Serial Accommodations.” Diasporic Women’s Writing. Spec. issue of Canadian Literature 196 (2008): 6-15. Print. Hall, Stuart. “Cultural Identity and Diaspora.” Identity: Community, Culture, Difference. Ed. Jonathan Rutherford. London: Lawrence and Wishart, 1990: 222-237. Print.